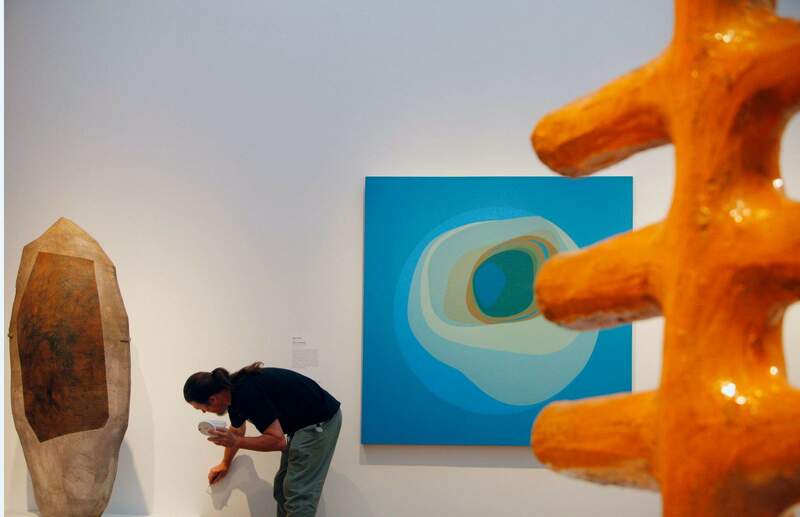 A Getty preparator mounts an oil on canvas titled Stage II, 1958, by artist Karl Benjamin for the upcoming show Pacific Standard Time at The Getty Center in Los Angeles. Between October February 2012, Pacific Standard Time will present a survey of postwar painting and sculpture in Los Angeles. 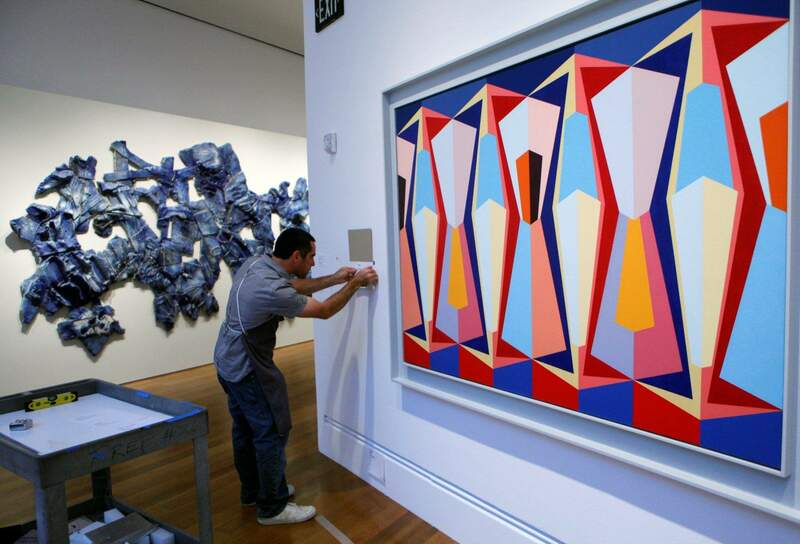 Getty preparator Michael Chomick touches up a wall for the upcoming show Pacific Standard Time at The Getty Center in Los Angeles. 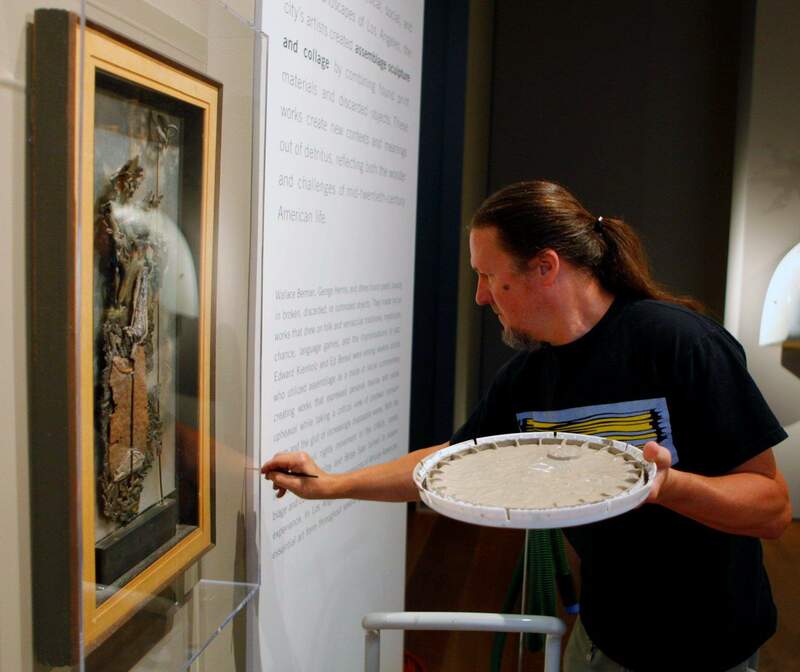 A Getty preparator places the last touches for the upcoming show,Pacific Standard Time at The Getty Center in Los Angeles. The the city itself: diverse, scattered all over the place and not always to everybodys taste. Thus the town that nurtured Ed Ruscha and Joe Goode to greatness, the sun-drenched berg that upstaged New York by giving Andy Warhol his first exhibition, the traffic-clogged metropolis that helped launch the graffiti art movement by providing Chaz Bojorquez the freeway overpasses to paint on, has rarely gotten its due in the rarified world of art criticism. It typically goes something like this: LA may have the palm trees, the movie stars and the perfect weather, but New York has the real artists. A massive effort to alter that mindset begins this week. Pacific Standard Time: Art in L.A.: 1945 to 1980, brings together 68 museums and more than 70 art galleries to honor seemingly every notable contemporary artist who ever made an artistic statement about the City of the Angels. The effort, 10 years in the making, is rolling out not only at institutions across Los Angeles, but as far away as San Diego and Santa Barbara, and will continue well into next year. With 130 exhibitions and countless catalogs, it highlights a hugely eclectic variety of movements and cultures, including feminist art, Chicano art, African-American art and Asian-American art, with forms ranging from cubism to open light to abstract expressionism to realism. Architecture and filmmaking? Theyre included too, not to mention the pottery- and furniture-making crafts. Has there ever been anything on this scale? As far as we know, no. Certainly not in the United States, said Andrew Perchuk, deputy director of The Getty Research Institute, which organized Pacific Standard Time and bankrolled it to the tune or $10 million. The effort by the research arm of the The Getty Center museum began as a much more modest attempt to document the contributions of post-World War II Los Angeles artists and institutions, including the Ferus Gallery, the modest Hollywood district venue that gave Warhol his first show. But as that scholarly study began to turn up a wealth of material from a huge cross-section of museums and galleries, it was decided to open up the results to the art-loving public as well. From that came a decision to launch full-blown exhibitions featuring the work of hundreds of artists. Its projects that all these institutions really wanted to do, sometimes for years, without having the resources or sometimes even the time to do it, Perchuk said of what Pacific Standard Time evolved into. Several programs document the Chicano art movement, featuring among many others the paintings of Magu Lujan, Carlos Almaraz, Frank Romero and Beto de la Rocha, who as Los Four are credited with helping popularize the colorful art form with a pioneering 1970s exhibition at the University of California, Irvine. The universitys role in the Light and Space movement, which also came to prominence in the 1970s, is examined in an exhibition at the Laguna Art Museum. It was a pivotal and largely-overlooked period, says Laguna curator Grace Kook-Anderson, and which produced such students as Chris Burden, whose stunning Urban Light installation, a maze of beautifully restored antique streetlights, is the first thing visitors encounter at the Los Angeles County Museum of Art. While still a student at Irvine, Burden also created the controversial performance art piece Shoot, in which he was filmed as a friend shot him in the arm with a .22-caliber rifle. Still other exhibitions highlight the contributions of African-American artists, including those whose work was inspired by the deadly Watts riots of 1965. Feminist artists such as Judy Chicago  who was born in Chicago but moved to LA as a teenager  also are also showcased. So is folk artist Simon Rodias masterpiece, the Watts Towers. Organizers are getting the word out with nearly 1,000 street-pole banners, numerous wrap-around ads on buses and online videos like one featuring Ruscha discussing art with Anthony Kiedis of the Red Hot Chili Peppers while the two cruise the streets of Los Angeles. Later in the year, architect Frank Gehry will discuss modern art with some of those he says have inspired his work, including Tony Berlant, Billy Al Bengston and Ed Moses. Whether that will happen remains to be seen. One person who has his doubts is Laddie John Dill, one of the artists who was at the core of Irvines Light and Space movement and whose works are featured in a half-dozen Pacific Standard Time exhibitions. He says a friend used to tell him Los Angeles is the better place for an artist to work because rent is relatively cheap and the weather allows one to maintain a large studio without paying a big heating bill. But from my point of view, still the platform or the showcase for contemporary art is New York, he said, adding that it has the better-known museums, more galleries, more well-heeled collectors and more respected critics. Claudia Bohn-Spector, who is curating Speaking in Tongues: The Art of Wallace Berman and Robert Heinecken at Pasadenas Armory Center for the Arts, disagrees. The effort is so all-encompassing, she says, that it cant help but have an impact, not only on artists and arts patrons around the world but on others as well.